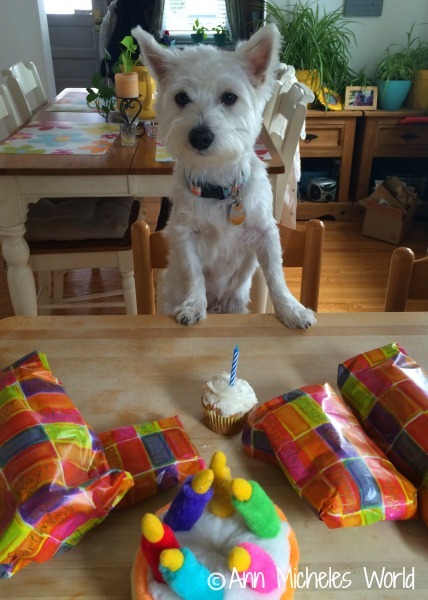 Happy Birthday to our little man Cooper. Otherwise known as Mr Cooper or Cooper Jake. It's his first and he's trying to figure it out all. The gifts have his tail wagging. Hard to believe he is a year already, seems like just yesterday he was all of 3 lbs. Though he is a Westie like Angel, he has a completely different personality. He is hyper, playful, loves to snuggle, scared of the oddest things, likes to steal socks, barks at every thing he sees or hears, some times quite a handful and overall a bundle of loving energy. Luckily he is neutered as he loves to hump things, including our arms. ha He brings a renewed sense of life and energy to the house. He's a people person who loves to be outside in nature. And keeps us on our toes for sure. Soon he will be taking his first class to learn some manners. And maybe even teach us a thing or two. So today we celebrate our Cooper who we love with all our hearts. Happy Birthday!